In the early and mid-nineteenth century, Marguerite Blessington, who had been born in Ireland but spent most of her life in London, became a famous salonnière; she was generally regarded as an important contemporary author, but as no literary executor took care of her oeuvre posthumously, she eventually moved into the background. Her novels, partly informed by the silver-fork genre, are typical examples of Romantic Victorianism, influenced by the Romantic cult of the solitary male self, by the fascination with Italy, and by the 1840s vogue of crime fiction, while simultaneously giving space to ambivalent reflections about Blessington’s own Irish background. 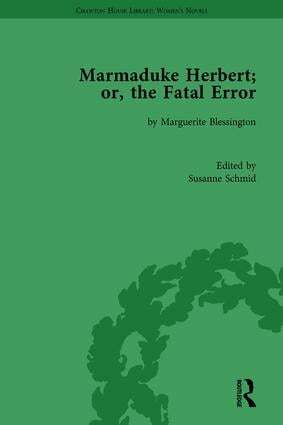 This volume, as part of ‘Chawton House Library: Women’s Novels’ series, presents her 1847 novel Marmaduke Herbert; or, the Fatal Error, a highly popular piece of fiction in its day, being reprinted in German, French and American editions within a year of its publication.